This book is for busy programmers who want a succinct and yet readable guide to C# 3.0 and LINQ. 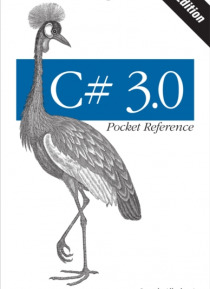 C# 3.0 Pocket Reference tells you exactly what you need to know, without long introductions or bloated samples.Despite its conciseness, this book doesn't skimp on depth or detail, and embraces the conceptual challenges in learning C# 3.0 and LINQ. Tightly focused and highly practical, this pocket refer… ence covers more ground than many of the big books on C#.C# 3.0 Pocket Reference includes plenty of illustrations and code examples to explain:Features new to C# 3.0, such as lambda expressions, anonymous types, automatic properties, and moreAll aspects of C# syntax, predefined types, expressions, and operatorsCreating classes, structs, delegates and events, enums, generics and constraints, exception handling, and iteratorsThe subtleties of boxing, operating overloading, delegate covariance, extension method resolution, interface reimplementation, nullable types, and operating liftingLINQ, starting with the principles of sequences, deferred execution and standard query operators, and finishing with a complete reference to query syntax-including multiple generators, joining, grouping, and query continuationsConsuming, writing, and reflecting on custom attributesYou'll also find chapters on unsafe code and pointers, preprocessor directives, XML documentation, and a framework overview. If you're already familiar with Java, C++, or an earlier version of C#, C# 3.0 Pocket Reference is an ideal choice.No other book or online resource can get you up to speed so quickly.